- Only can use matching chargers, ventilation and heat dissipation is required for a charge. - Don't put the battery in the toolbox or pocket, so as not to cause the battery short circuit or extrusion. - It is forbidden to close to the fire to avoid explosion. - Save battery at room temperature, it is strictly prohibited in more than 60 ℃ high temperature environment for a long time. - Rechargeable batteries, the more the smaller battery capacity, when the ambient temperature is lower than 0 ℃, affect the rechargeable battery charging effect.Under the condition of normal, rechargeable batteries can be recharged 500 times more. Capacity: 2100mAh, Power: 6 Volt, Size: LxWxH=56mm x 25mm x 80mm, Type: Rechargeable Ni-MH battery. Built-in IC, thermal protection, overcharge protection, over-discharging，short-circuit protection, mechanical, electrical protection against reversal polarity, and auto defective battery identification. 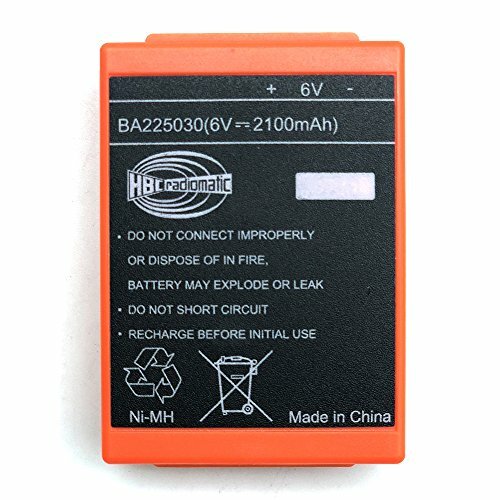 Battery for FuB05AA (old) and BA205030. Rechargeable batteries, the more the smaller battery capacity, when the ambient temperature is lower than 0 ℃, affect the rechargeable battery charging effect.Under the condition of normal, rechargeable batteries can be recharged 1000 times more. Warning tips: Only can use matching chargers, ventilation and heat dissipation is required for a charge. Don't put the battery in the toolbox or pocket, so as not to cause the battery short circuit or extrusion. It is forbidden to close to the fire to avoid explosion. Save battery at room temperature, it is strictly prohibited in more than 60 ℃ high temperature environment for a long time. If you have any questions about this product by IORMAN, contact us by completing and submitting the form below. If you are looking for a specif part number, please include it with your message.